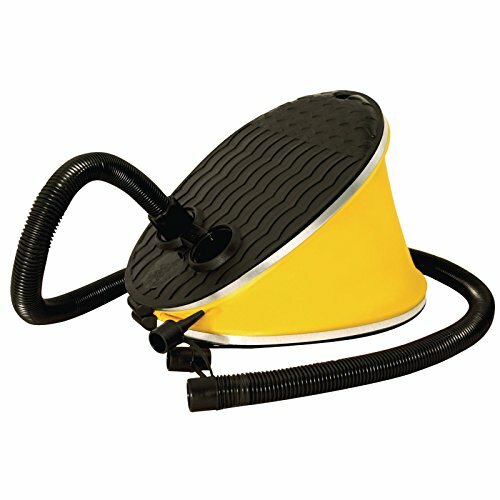 AIRHEAD® Hi-Volume Bellows Action Foot Pump - Use your foot to inflate or deflate towables, boats and other inflatables with AIRHEAD’s HI-Volume Bellows Action Foot Pump. This durable air pump has a 54” long hose and 3 adapters to fit most valves. The air displacement per stroke is 0.5 liters. Since the pump achieves a maximum air pressure of 2 psi, you can get your inflatable boats and towables nice and firm. It collapses to fit under kayak decks or boat seats.